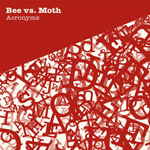 Bee vs. Moth is a funky instrumental outfit. The latest release, Acronyms, provides the perfect music for a party, dancing, a quiet dinner. The band’s range is majestic, invigorating and hip. There’s surf instrumental [“Peter Benko”], alt-jazz [“Pennies from Hell”], circus tinged [“ICP on Parade”], country twang [“Now More Than Ever”] and old film noir [“The Sky and The Dirt Earth”]. Acronyms is a party album to be played in its entirety. It’s fabulous. Bassist Philip Moody and drummer Sarah Norris started Bee vs. Moth and began performing around Austin six years ago. The band has since grown into a five-piece ensemble. This entry was posted on August 28, 2010, 14:03 and is filed under Music. You can follow any responses to this entry through RSS 2.0. Both comments and pings are currently closed.